The first of our three children is turning 16 and we have been surveying and considering all of the strategies our friends have used in helping their child get their first car. At the school our children attend many, if not most, are given a new car of their choice. This is not a standard that we wanted to follow or could afford to follow for 3 children over the next six years. We knew our first priority was safety and wanted to find a car with good safety ratings. We also wanted reliable, affordable, good gas mileage, insurable and something he would like. My mother offered her 10 year old Toyota Camry with 75,000 miles. It seemed to fit all of our criteria, but our son was not excited about driving Grandma’s car. After talking with several friends we came to the following strategy. Budget of $10,000. We figured that $10,000 could get a dependable later model car that would last through college. We pay half and our son, Drew would pay half. Drew pays a minimum of $500 down and $150/month, but can pay off faster if he wants. This gives him ownership in the vehicle and teaches him about responsibility of making payments on time. If he misses a payment, he loses the keys. Let Drew pick out a car with our veto authority. This ensures that he finds something he likes and is likely to take good care of the vehicle. The Jeep was vetoed. We would add him to our insurance. We transfer gas money to his checking account monthly to cover travel to school and some afterschool activities. He will be responsible for the cost of any extra gas required. 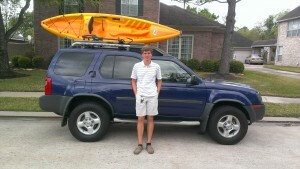 He landed on a Nissan Xterra and has been thrilled with the purchase. The one thing I did not expect that has been a good surprise is his pride in participating in the purchase. Most of his friends may announce that they “Got” a new car. While at another family friends home for dinner Drew announced that “He Bought a new car”. I did not expect the reaction to the subtle difference. “So, you BOUGHT a new car?” I enjoyed listening to Drew share his pleasure in participating in the ownership of his new vehicle and believe he will enjoy and care for his new vehicle. We never forget buying our first car and all that comes with the new freedoms of driving. It is a milestone that marks your son or daughters progress to independence and it is a great opportunity and privilege to help them think through the options and make good choices. This entry was posted in Family Vision, Mission, Core Values, Rites of Passage and tagged first car, parent strategy for new car, parenting articles, parenting books. Bookmark the permalink.